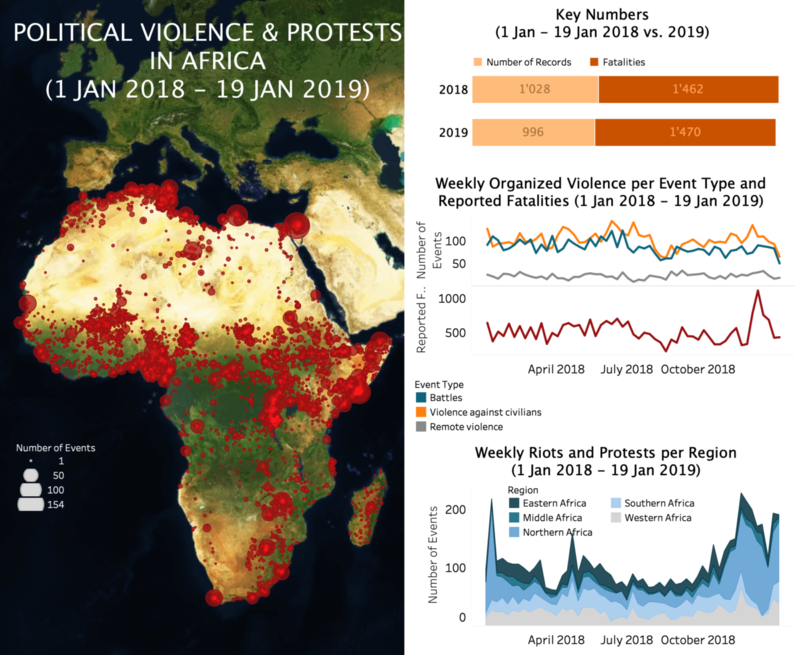 Key developments in Africa in the week of January 13th include the Al Shabaab show of strength in Kenya amidst heavy defeats in Somalia; the violent ethnic attacks in Nigeria, Mali and Ethiopia; and the unrest in Zimbabwe and Ivory Coast. One of the key developments last week was the Al Shabaab attack on people in the upscale DusitD2 hotel complex in the Parklands/Highridge estate of Kenya’s capital Nairobi on January 16th. Al Shabaab militants detonated explosives outside the building before entering and opening fire resulting in at least 21 fatalities and many injuries. This was the militants’ first high-profile attack in Nairobi since they targeted the Westgate Mall on September 21st-22nd, 2013, which killed 67. Two days later, in Somalia, Al Shabaab militants ambushed Ethiopian soldiers outside Buur Xakaba (Bay province), inflicting among the highest death tolls (57) on Ethiopian troops in the country to date. These two events represent a significant escalation from Al Shabaab, who is coming under increasing pressure in Somalia, particularly from US air and drone strikes. Over 60 US airstrikes have been recorded against the group in the ACLED dataset between January 2018-January 19th, 2019, resulting in around 450 fatalities. 70% of these fatalities have occurred over the past three months. Last week, US forces carried out among their deadliest airstrikes to date, reportedly killing 52 Al-Shabab militants at once in Jilib (Middle Juba). High fatalities were also reported from a number of other attacks across the continent last week. In Nigeria, unknown gunmen aboard 25 motorcycles attacked three villages in Gandi district (Sokoro state), along the border with Zamfara state, killing 26 civilians. The attacks occurred in the middle of an axis due to be strengthened to support the Nigerian military’s operations against armed bandits and cattle rustlers in Zamfara state. In Mali, suspected Islamic State (Greater Sahara) militants attacked three villages in the Menaka and Ansongo cercles (Gao region) on January 15th, clashing with Tuareg and Dawsahak militias as well as executing civilians. 42 people were reported killed in total. Lastly, in Ethiopia, suspected armed cattle raiders killed at least 37 settlers from the Kambata ethnic group in the Keffa zone of the Southern Nations region. A previous attack had been recorded in similar circumstances on October 2nd, 2018. Ethnic violence remains significant in Ethiopia and spans all regions. Lastly, there were two significant waves of demonstrations last week. In Zimbabwe, protests, riots and strikes erupted following president Mnangagwa’s announcement of a sharp rise in fuel prices on January 13th. Police and military forces responded to the demonstrations with live fire and tear gas, and beat people during door-to-door searches throughout the week. Armed youth from the ruling Zimbabwe African National Union-Patriotic Front (ZANU-PF) accused opposition the Movement for Democratic Change (MDC) of leading the protests: they searched the homes of MDC leaders in Harare and beat and abducted their relatives. At least 12 people were reportedly killed in the unrest and more than 600 arrested. Although political violence has been at minimal levels in Zimbabwe since the July 2018 national and local elections, a number of large protests have been held in recent months over the deterioration of the country’s economic situation. Last week’s quick popular reaction to the economic measure as well as the security forces’ violence showed continued instability in the country, risking undermining Mnangagwa’s international fundraising efforts to address the economic challenges. In Ivory Coast, protests and riots erupted following the International Criminal Court (ICC)’s decision to acquit ousted President Laurent Gbagbo and his ex-Minister, Charles Ble Goude, of crimes against humanity. The victims’ group organised at least seven demonstrations over January 14-17th, mostly in Abidjan district communes, Bouake (Gbeke) and Korhogo (Poro). Gbagbo was handed to the ICC in 2011, following months of post-election violence that left thousands of people killed as he refused his loss against Alassane Ouattara in the runoff presidential elections.The ICC’s decision is likely to further destabilise Ivorian politics as the 2020 elections near.